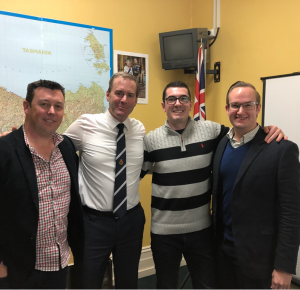 Adam Poulton, Board Director of the Northern Tasmania Development Corporation (NTDC) recently invited Sam Webb, Chief Operations Officer of BlockGrain, to visit Launceston from their base in Melbourne. The visit was organised to allow Sam to meet with some local businesses involved with the digital and agricultural sectors to investigate how this innovative technology could benefit agribusinesses in the region. BlockGrain uses an integrated software platform that helps increase supply chain efficiency by enabling full traceability of a commodity from end to end and uses a blockchain to record information and provide a trusted data repository. NTDC Director, Adam Poulton, said that “while BlockGrain has been developed based on agricultural commodities, the organisation was interested to see how this application could be used to solve issues across other sectors that are reliant on the quality of their logistics and supply chain. One example could be ensuring cold foods are kept at below 4 degrees for the whole journey from producer to customer. Or by proving that products are authentic, and not fakes, by providing traceability of the product (and where it has been) from origin to the customer” he said. The CEO of NTDC, Maree Tetlow, said “our interest in this new technology is to improve efficiencies in our freight and logistics and add value to our premium produce. As all exported goods are reliant on third parties to ensure the products arrive in good condition, having extra transparency and accountability can only help. As a region, we leverage Brand Tasmania and trade on the quality of our agricultural produce and manufactured goods. This technology could help drive demand for authentic Tasmanian products in the future. Agriculture is already a major driver of the Northern Tasmanian economy, and Food Manufacturing is poised to become a major industry within the next 10 years” said Maree Tetlow. Northern Tasmanian businesses leaders, such as, Mike Cruse (Definium) and David Skipper (TAP AgriCo), were invited to join NTDC and BlockGrain representatives to explore mutual opportunities as BlockGrain continues to expand. BlockGrain helps new sectors to establish, and improves the overall bottom line performance of those already established by conducting business through one, simple platform. Sam Webb also briefed the Hon Michael Ferguson, Minister for Science and Technology, on his company’s developments. NTDC is an initiative of seven Northern Tasmanian Councils to achieve the following regional and economic targets over 10 years: increase the Gross Regional Product by 50%; create 8,000 new jobs; and increase the average weekly pay by $100.